- 909 riders were directly involved in the repair of their own bicycles. This is what we train for people! - 36 comrades were transported from Minneapolis to Black Rock City (1 additional comrade was picked up in Iowa). Most of these were returned safely to Minneapolis. - We left no trace! We achieved a Green MOOP score, BRC's highest rating. In 2017, part of our address was given a red score. 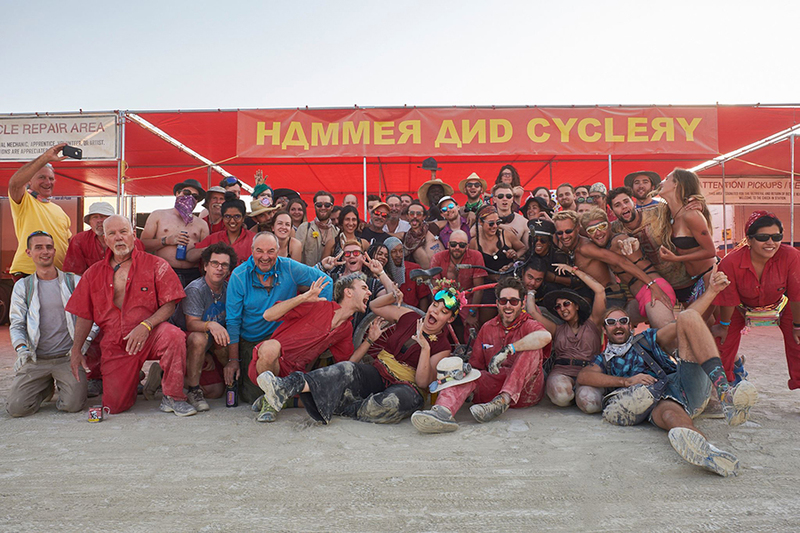 - We provided unlimited spare tubes and bottomless bottom brackets for anyone that needed these during Burning Man. Not only did this leave people with significantly more functional repairs, it decreased repair and wait times significantly! - We had frontage art! In 2017, we were pretty much the semi-trailer camp. In 2018 our frontage presented an unbroken wall of art. - With staffing, layout, and other logistics improvements, we dropped average wait times for our renters significantly. At our worst in 2017, people were turned away and told to return the next day because we couldn't get them bikes in a reasonable amount of time. In 2018, we had one snafu that resulted in a handful of renters sitting around for an hour. We aim to continue to do better in 2019, but that's worth a pat on the back. - We moved our mechanics off of the frontage to protect them from the crush of the line. This gave us and our participants room to breath and time to teach. - WAY MORE frontage shade not only protected our crew, but both the repair and rental lines waited under the comfort of our shade structure. - Overlapping work shifts allowed us to open and close on time (more or less) with significantly more service continuity during the middle of the day. Great success! - The Ramp changed everything! - We performed a complete overhaul of the supply trailer after Burning Man this year. I am so excited to show off the new organizational system. You will be impressed! In 2016 Hammer And Cyclery consisted of just 2,100 sq ft of shade. In 2018, we lived and worked under 14,000 sq ft of shade comprised of 26 panels, 528 connectors, and a whopping 788 individual 10' steel poles. This was a huge leap forward for our camp. Our shade was the envy of the neighborhood. And in 2019, we will do more! Kitchen! In 2017 we made one dinner per day. In 2018 our kitchen crew turned out 3 full meals prepared for the entire crew each and every day from setup to tear down. Making this leap meant renting a refrigerator trailer for the first time and keeping it cold as we crossed the country. It meant doubling our generator capacity and quadrupling our propane supply. It meant food deliveries during Burning Man. We increased the size of the kitchen by a third. We more than doubled the kitchen crew. These people started planning and purchasing months in advance, got up early to make us breakfast, and stayed late to put dinner away each night. Thank you, kitchen crew! In 2017 we attempted a new processing system for cleaning and repairing the rental fleet after Burning Man. It failed completely. This meant that almost the entire fleet had to be processed both before AND after Burning Man 2018. Some of us lived in Nevada for almost 3 months last year. I spent more total hours living with Tony and Deysi than with Elizabeth in 2018. Thank you, clean-up crews! - More vinyl flooring. Not only does this flooring make clean-up easier, it's much more comfortable to walk on. - Planning and prep is well under way! More than half of our Amazon purchasing is complete. We are already soliciting rental vehicle quotes and making reservations. 2019's jumpsuits have arrived and await screen printing. And a few other surprises are in the works.